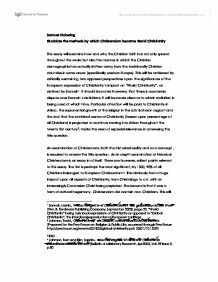 This essay will examine how and why the Christian faith has not only spread throughout the world but also the manner in which the Christian demographic has actually shifted away from the traditionally Christian countries in some areas (specifically western Europe). This will be achieved by critically examining two opposed perspectives upon the significance of the European expression of Christianity’s impact on “World Christianity”, as defined by Sanneh. It should be noted however, that there is academic dispute over Sanneh’s definitions. It will be made clear as to which definition is being used at which time. 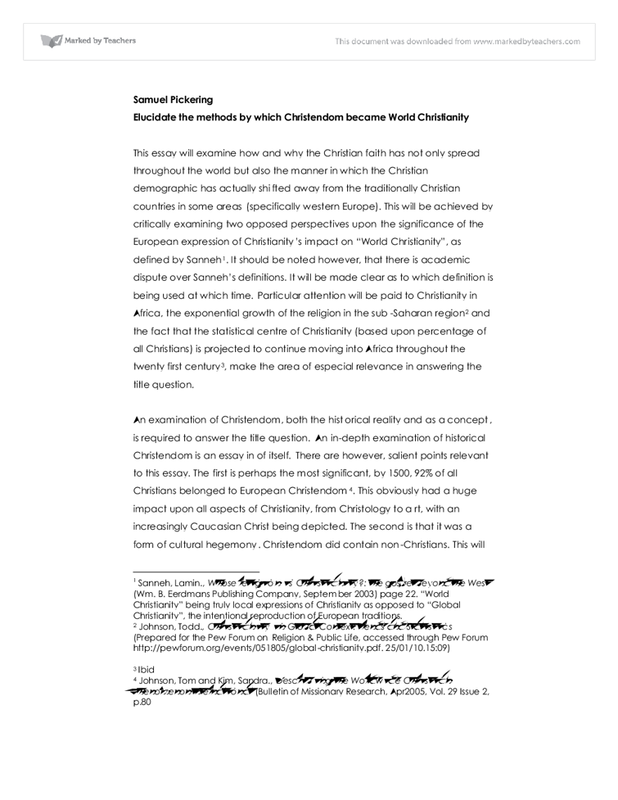 Particular attention will be paid to Christianity in Africa, the exponential growth of the religion in the sub-Saharan region and the fact that the statistical centre of Christianity (based upon percentage of all Christians) is projected to continue moving into Africa throughout the twenty first century, make the area of especial relevance in answering the title question. An examination of Christendom, both the historical reality and as a concept, is required to answer the title question. An in-depth examination of historical Christendom is an essay in of itself. There are however, salient points relevant to this essay. The first is perhaps the most significant, by 1500, 92% of all Christians belonged to European Christendom. This obviously had a huge impact upon all aspects of Christianity, from Christology to art, with an increasingly Caucasian Christ being depicted. The second is that it was a form of cultural hegemony. Christendom did contain non-Christians. This will become pertinent when discussing modern ideas of Christendom. The concept of Christendom still exists today (see conclusion). The Christendom model of conceptualizing the international scope of the Christian faith is rooted in geopolitical and economic power. They trace this practice back to the seventeenth-century principle of cuius regio, eius religio, literally, “whose the region, his the religion.” Henry VIII, making himself the first absoloute monarch, freeing himself of Rome’s influence is a singular example of this. By this rationale then, Christianity only succeeds as a religion when it succeeds in the material world in terms of wealth, power and land. This would naturally lead to a militant and intolerant Church. It is interesting to view historical Christendom with this in mind as in many ways history (Crusades and the Inquisition are only two examples of many) matches the theory. Pertinent to this essay is that mission within Christendom would not be as concerned with “indigenous appropriation and expression of the Christian faith on a grassroots cultural level; rather, it is more concerned with the presence and influence of the Christian faith on the geopolitical level”. This would definitely take the form of Sanneh’s “Global Christianity”, any variation from the European expression would be treated with intolerance. The first perspective referred to in the introduction, is that European Christianity is indeed a single facet of a global Faith and an increasingly marginal one at that. Theologians such as Peter Phan have made much of the shifting demographic of Christianity, Phan claiming that by 2050 only one fifth of Christians will be “Anglo’s”. The statistical data, which is already referenced, supports this. However, this argument, while valid and supported by hard statistics, hinges upon the non-European expressions of Christianity being separate and distinct from the European expression of Christianity. For example, even if the religion were to disappear completely from Europe, if the models of Christianity found elsewhere were inherently European in nature, Christianity could be said to still be a European religion. Therefore, demographics alone can not form a strong argument. It is necessary to investigate the extent to which European Christianity has shaped Christianity around the world. The natural starting point for such an examination is missionary work conducted by Europeans to other parts of the world. Africa is a suitable case study and as mentioned by Conway and Davies, many of the Christian Initiativesin the twentieth century, which impact upon millions of Africans today, were African in origin. While there are millions of African Christians belonging to denominations which originate in Europe, for the purposes of this perspective, such denominations are unsuitable as they will obviously contain European elements. Thus the African Initiated Churches will be the primary focus here, by definition lacking overt European influence, their distinct African nature makes them part of Lamin’s “World Christianity”, as opposed to European initiated expressions which replicate European forms. Perhaps the most strikingly different to European Christianity are the amaNazarites of Isaiah Shembe, founded somewhat ironically in white controlled South Africa. Shembe composed liturgical hymns in Zulu and the church draws some of the largest Christian crowds in the world at its meetings. This church is African in every possible sense of the word and its existence would seem to decisively prove the existence of “world Christianity” (Sanneh’s definition), showing that there are culturally and theologically distinct expressions of Christianity outside of Europe, unaffected by European missionaries. Indeed in Charles Marsh’s work Wayward Christian soldiers, the historical demographic of Christianity is examined, stating that of the five ancient patriarchates of Christianity, only Rome was in the West the others were in Asia and Africa. Further to this many, if not most, of the early scholars of Christianity who shaped the religion, were not European. This work could then be used to further an argument that European Christianity was only ever one interpretation of the religion. A secondary point linked to this issue is the impact of American missionaries. Mark Noll raises interesting points about this. Noll examines the impact of Western Christianity in general and North American Christianity in particular, upon the growth of the religion around the world. This raises several points such as the differences between European/North American expressions of Christianity, how prevalent missionary activity is from both expressions and if said differences conveyed by missionaries. The natural progression of this perspective is then to examine the growth of World Christianity. Prior to World War I, there was mention of “World Evangelisation”. Obviously not the same concept but understandable when the demographics are considered, eighty percent of the worlds Christians resided in the West. Evangelisation suggests that the focus is upon converting non-Christians however, still suggesting the mental framework and attitudes characterising colonial era Christianity. Johnson and Kim mark the term “World Christian” appearing “as a transitional phrase that emerged after World War I as an educational concept to help(specifically American) Christians gain more respect for other peoples of the world.”  Interestingly then, the term actually predates “world Christianity” but refers to cultural awareness and sensitivity that has come to be viewed as vital in modern ecumenical dialogue. The phrase “world Christianity” emerged after the first World War and was not solely an acknowledgement of the shifting demographic of Christianity. The beginnings of Communion Ecclesiology, stemming from the likes of Vatican II, was starting to allow local variations and contributions of indigenous expressions of Christianity to be viewed as an occurrence to be welcomed rather than tolerated. This was undoubtedly linked to the shattering effect of World War I on Europe. Christians losing confidence in their “cultural” form of Christianity in began to focus instead upon the uniting aspect of Christianity. While overt acknowledgement of the value of non-European expressions of Christianity was not yet manifest, there was a pronounced softening of intolerance and non-Western Christian leaders were given more scope to voice their opinions. This can best be viewed in the composition of world missionary conferences. In Edinburgh in 1910, only 17 of 1,100 delegates were “nationals” from mission fields. At Jerusalem in 1928, a quarter of the delegates came from younger churches, and at Tambaram in 1938 half were non-Western. This was definite progress toward “world Christianity”. However, while it was increasingly permissible to look upon indigenous Christians as suitable for spreading the Gospel throughout their own countries, it is debateable how much respect they were truly afforded as theologians in their own right. Philip Jenkins in “The Next Christianity”, likens the current situation to a new reformation, with geographical rather than denominational in nature. This provides an interesting observation about a very real aspect when examining the title question, the power and authority which groups of Christians can have over their denomination’s Church as a whole. An example to illustrate this is the Roman Catholic Church. Possessing a central authority structure in Rome and a European language (Latin) as it’s lingua Franca, there will always be a European character to the denomination as a whole. However, Vatican II allowed for more expression of local culture within Roman Catholicism and there is a very real possibility that the next Pope will be African. The presence of large numbers of immigrants, a reality throughout most of the Western world, can affect the established churches, even of the same denomination. Remaining with the example of Roman Catholicism, the large and increasing population of Latinos in the United states of America (estimated to become one quarter of the total US population by 2050), will almost certainly begin to influence the existing “white” Roman Catholic churches in a number of areas. The Latino Catholics are noticeably more conservative than their Anglo counterparts and display distinctive liturgical differences, including a pronounced veneration of the saints and the Blessed Virgin. Thus, even for Christian denominations whose power bases remain in Europe (which includes North American Roman Catholics) for Ecclesiological or historical reasons, there is still scope for “World Christianity” to develop. The second perspective mentioned in the introduction opposes the first, while mostly rejecting Belloc’s assertion that “Europe is the faith”, views other expressions of Christianity as stemming from the European tradition. If proven, this perspective would negate Sanneh’s definition of “world Christianity” and there would instead only be Christians around the world who are using the European Christianity archetype in some form (Sanneh’s global Christianity”). Maia green in her work, Priests, Witches and Power: Popular Christianity after Mission in Southern Tanzania, asserts that, in Tanzania at least, modern African Christianity is a continuation of European missionary work, even when it is no longer present. While controversial, it can extremely difficult to differentiate between facets of African Christianity which are indigenous and those which have been imported from abroad, which again leads to examination of the African Initiated Churches. While groups such as the amaNazarites do indeed have little in common with European denominations beyond a belief in Jesus Christ, there are those who question if such groups are Christian sects or different religions altogether. An example would be the belief among many amaNazarites that Isaiah Shembe was God and statements from his son and grandson that he was a “black Christ”. Both positions are obviously unacceptable to many Christians, European or otherwise and leads to the debate about whether a group referring to themselves as Christian makes them so, which will not be discussed here and to syncretism, which will. In conclusion of this point, it could be argued that those expressions of Christianity which were not based upon the work of European missionaries are vulnerable to being declared new religions and thus not part of the global Christian faith. Syncretism is a charge increasingly levelled at non-European churches. Korean theologian Hyun Kyung Chung created a great deal of controversy following a liturgical presentation at the 1991 World Council of Churches annual meeting, which included elements and practices from Asian Shamanic religions. This raises the question as to when such syncretism removes the practice from Christianity. This is separate to the point already made about new religions as some cultural changes are inevitable and even useful when Christianity is introduced to a new culture. However, when key elements such as liturgical practice are altered, an argument can be made that such practices are no longer Christian. Denominations originating from Europe are not immune to syncretisation. They are however, more resistant due to the existence of regulatory organisations such as the Congregation for the Doctrine of the Faith, whose role includes the opposition of such changes. Thus, European expression of Christianity could be seen as the expression as regards purity of tradition. synthesis, borrowing and change” that takes place in all international religions. Thus “global Christianity” would here be almost diametrically opposed to Sanneh’s view and would instead resembles the ideal of the early church. One in which every expression of the religion is valid and Christianity is a true faith as opposed to a cultural/political model with religious overtones, a viewpoint of the detractors of historical Christendom and colonial era mission. In conclusion, while the majority of material available favoured the position that the European tradition of Christianity is only one expression of many, there is substantial scholarly work opposed to this. While there is a danger of adopting a patronising mindset while discussing non-European Christianity, political correctness alone should not prevent frank discussion about syncretic practices. The issue will become increasingly significant as the Christian demographic increasingly shifts from Europe and there is still no clear answer to the question posed. Finally, in response to the title question, while as a concept Christendom is now largely defunct, the situation it once represented is coming into existence once again. Jenkins attempts to redefine Christendom in a manner in which the term is no longer a social faux pas and appropriate for use with non-European Christians. He writes“Today across the global South a rising religious fervour is coinciding with declining autonomy for nation-states, making useful an analogy with the medieval concept of Christendom—the Res Publica Christiana—as an overarching source of unity and a focus of loyalty transcending mere kingdoms or empires. Kingdoms might last for only a century or two before being supplanted by new states or dynasties, but rational people knew that Christendom simply endured. The laws of individual nations lasted only as long as the nations themselves; Christendom offered a higher set of standards and mores that could claim to be universal. Christendom was a primary cultural reference, and it may well re-emerge as such in the Christian South—as a new transnational order in which political, social, and personal identities are defined chiefly by religious loyalties.”A lengthy quote but one whichdemonstrates that Jenkins is not necessarily stretching the concept of Christendom excessively. This relates to the “palpable missiological confusion” of Douglas John Hall, that the viewing of the expansion of Western power and political influence as a means, or even the goal, of Christian mission is due to the need to Westerners “to tell the Christian story as a success story.” This is increasingly significant in the post-colonial era, when overt control by Western powers is rare and likely to become rarer. Added to this is the lack of boundaries for any modern Western Christendom. North America and the countries of the European Union have practitioners of every faith and denomination and their religious freedoms are protected by law. This presence of other faiths, along with the decline of Christian cultural hegemony in the West, to allow what Hall describes as an opportunity for Western Christians as they lose their cultural and religious dominance and gain the ability to become the “the salt, yeast, and light of the world.” While it is unlikely to become a true polity again, Christianity may well be turning a full circle back to a new Christendom. Belloc, Hilaire., Europe and the Faith (BiblioBazaar 27 Sep 2006). Conway, Martin and Davies, Noel., World Christianity in the Twentieth Century (SCM Press September 30, 2008). Hexham (Editor), Shembe (Translator), Becken (Translator)., The Scriptures of the Amanazaretha of Ekuphakameni: Selected Writings of the Zulu Prophets Isaiah and Londa Shembe (University of Calgary Press, 1994). Jenkins, Philip., The next Christendom: the coming of global Christianity (Oxford University Press, USA March 31, 2002). University of Calgary (http://www.ucalgary.ca/~nurelweb/books/shembe/s-index.html accessed 29/10/09.16:10). Sanneh, Lamin., Whose religion is Christianity? : the gospel beyond the West (Wm. B. Eerdmans Publishing Company, September 2003) page 22. “World Christianity” being truly local expressions of Christianity as opposed to “Global Christianity”, the intentional reproduction of European traditions. Sanneh, Lamin., Whose religion is Christianity? : the gospel beyond the West pps. 2-4. Conway, Martin and Davies, Noel., World Christianity in the Twentieth Century (SCM Press September 30, 2008) page 114. Johnson, Tom and Kim, Sandra., “Describing the Worldwide Christian Phenomenon International” Page 81. Jenkins, Philip., The next Christendom: the coming of global Christianity (Oxford University Press, USA March 31, 2002) page 120. Belloc, Hilaire., Europe and the Faith (BiblioBazaar 27 Sep 2006) Page 10. Hebden, Ross and Morehead., Encountering New Religious Movements (Kregel Academic & Professional 1 Jan 2004), pps 109, 110. Hexham (Editor), Shembe (Translator), Becken (Translator)., The Scriptures of the Amanazaretha of Ekuphakameni: Selected Writings of the Zulu Prophets Isaiah and Londa Shembe (University of Calgary Press, 1994) page xix. Confusingly, this definition of “global Christianity” matches Sanneh’s definition of “world Christianity”. This neatly demonstrates the importance of semantics when choosing definitions in this area of study. Even the assumption were true, the improvement suggested could merely be a moral code that is changed so as to better suit the conditions that the society lives under , rather than a code that is clearly better in every way than the previous code. Martin (1967) argued that some people attended Church for social motive, rather than holding strong religious belief. This resulted in church attendance numbers being inflated, this questions whether or not it is valid to interpret declining attendances as evidence of a gradually loss of religious faith in society. (Hitler, 1938) 'Surely if the human race is under threat, it is entirely reasonable to segregate AIDS victims, otherwise the whole of mankind could be engulfed.' (The Daily Star, 2 December 1988) Although an extreme illustration, the above quotes serve to set up the creation of a 'moral panic'. A crowd that on one hand, during mass, would piously stretch out their hand to you and say, "may the peace of God be with you"; but on the other, avoid a simple "hello" if they saw you at the mall. Church also played a substantial role in Education. State policies endorsed the granting of land to the Church for the construction of schools and monasteries. Furthermore, the Church reinforced the authoritarian and absolutist regime of the Monarchs serving to primarily advance the interests of elite classes while simultaneously appeasing the lower level classes in spite of significant class inequality. as an improvement on Bush?s, but also highlights Obama wish to include both religious and non-religious groups.